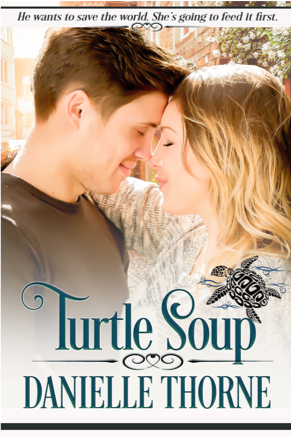 Sea turtles may be endangered but after an encounter with marine biologist, Jack Brandon, nothing will stop Sara Hart from naming her deli, Turtle Soup. When Jack takes a job at the Georgia Aquarium nearby, Sara finds the environmental poster boy at her door, hungry but carrying a chip on his shoulder. Neither thinks the other has what it takes, until a scuba class reveals what lies beneath the surface. Danielle Thorne is the author of classic romance and adventure in several genres. She loves Jane Austen, pirates, beaches, cookies, cats, dogs, and long naps. She does not like phone calls or sushi. A graduate of BYU-Idaho, Danielle saw early work published by Arts and Prose Magazine, Mississippi Crow, The Nantahala Review, StorySouth, and… you get the idea. Besides writing, she’s edited for both Solstice and Desert Breeze Publishing. Her growing blog, The Balanced Writer, focuses on writing, life, and the pursuit of peace and happiness. Currently, Danielle freelances as a non-fiction author while waiting to hear from readers like you through her website. During free time, which means when Netflix is down, she combs through feedback and offers virtual hugs for reviews. Her next historical romance is coming soon.